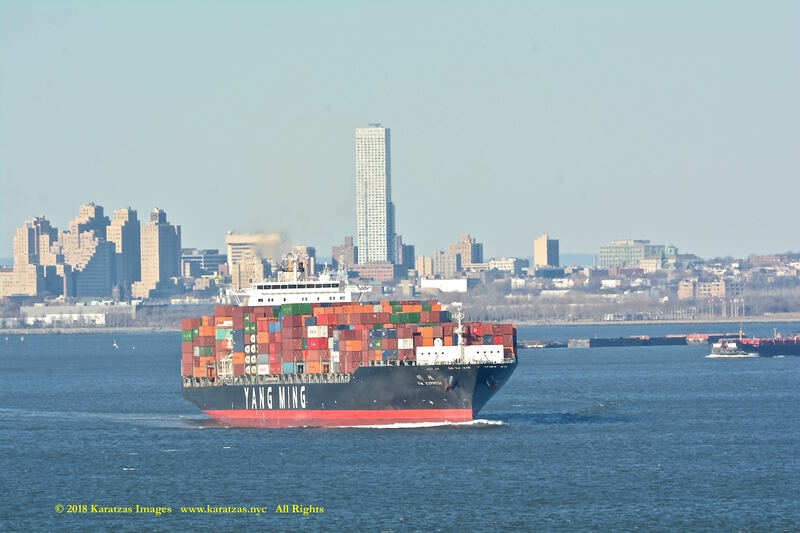 Posted on January 19, 2018 by Karatzas Marine Advisors & Co. 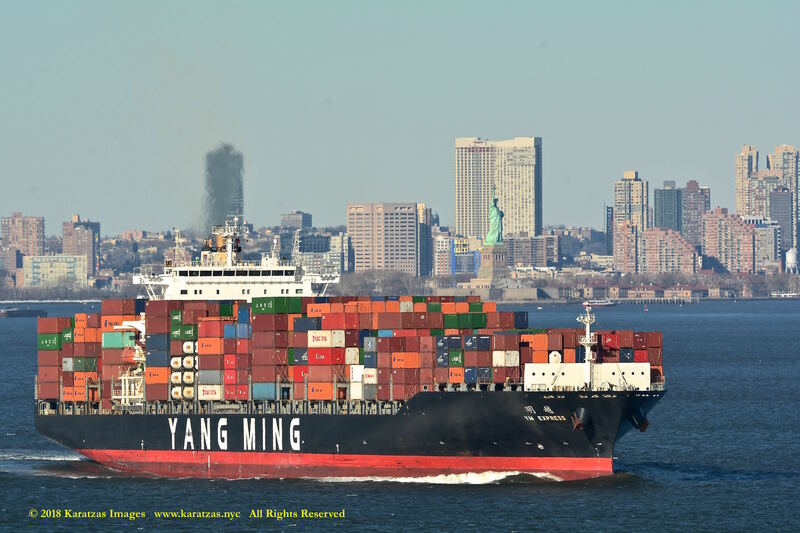 VESSEL IDENTIFICATION & DESCRIPTION: Launch Name was YM Express. 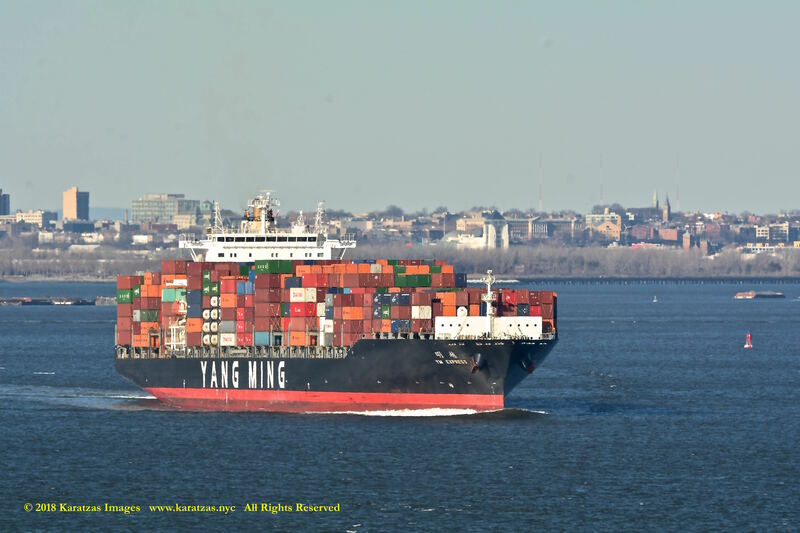 Intermediate Containership 3,000-5,999 TEU, Call Sign D5HJ4, IMO Number 9496628. 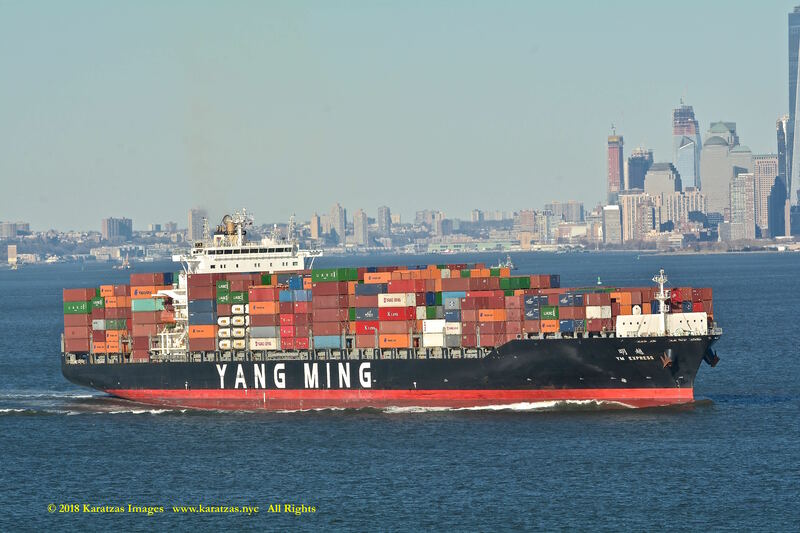 Built at CSBC (Kaohsiung), Liberia Flagged, DNV GL Classed, Length Overall of 259.00 m., Length Between Perpendiculars of 246.40 m., Draught of 11.80 m., Beam of 37.30 m., Gross Tonnage of 47,950, Tonnage of 41,604 Suez Canal Net, 20,411 International Net and 56,415 Dwt (long). 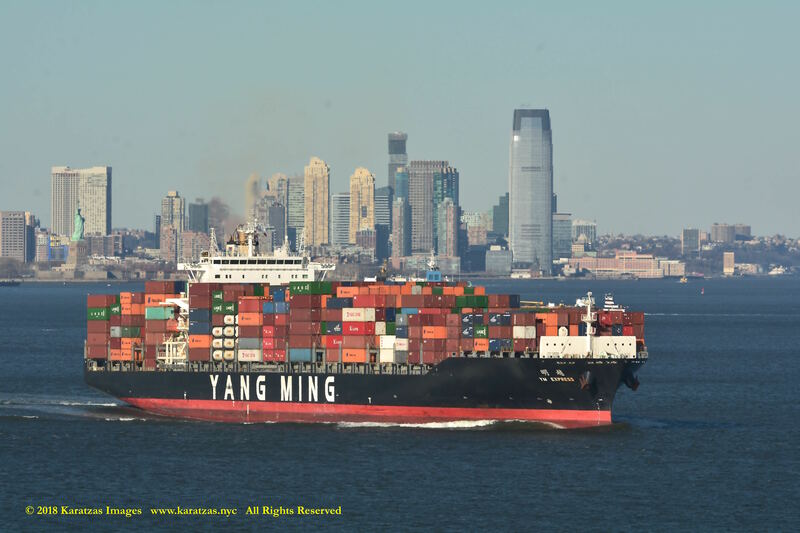 VESSEL’S OWNERS / MANAGERS: Yang Ming Marine Transport Corp, Taiwan. CARGO HANDLING DETAILS: Total TEU Capacities of 4,660 Total, including 800 Reefer, 400 Reefer Plugs. Ship is able to transit the newly expanded locks of the Panama Canal, but is not able to transit the old locks. No Cargo Gear. MAIN ENGINE & AUXILIARIES: 1 x Diesel – MAN B. & W. 7K98MC6.1 – 2-stroke 7-cyl. 980mm x2660mm bore/stroke 35,140mkW total at 90rpm. 3 x Aux. Diesel Gen – Daihatsu 8DK-28 – 4-stroke 8-cyl. 280mm x 390mm bore/stroke 5,700mkW total at 720rpm driving 3 x Nishishiba NTAKL-VCP – AC generator(s) at 7,140ekW total, (8,925kVA total) at 60Hz. PROPULSOR & POSITIONING: 1 x FP Propeller (Aft Centre) (mechanical) (Ni-Al Bronze), Mecklenburger, 90rpm. 1 x Pos, Tunnel Thruster (Fwd.) (electric), Kawasaki KT-157B5, 1,160rpm. SALE & PURCHASE HISTORY: Reported newbuilding contract price of US$ 75 mil (originally ordered in 2008). 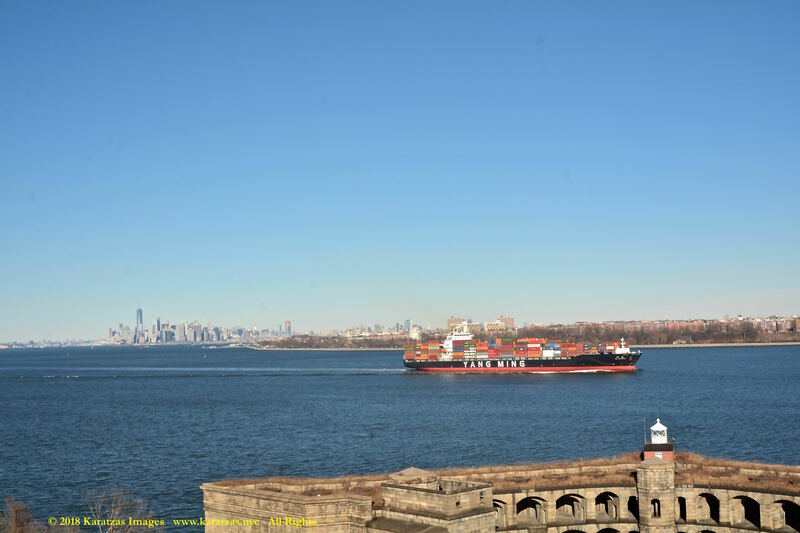 Panamax containership of 4,600-teu MV “YM Express” departing New York. Image credit: Karatzas Images. 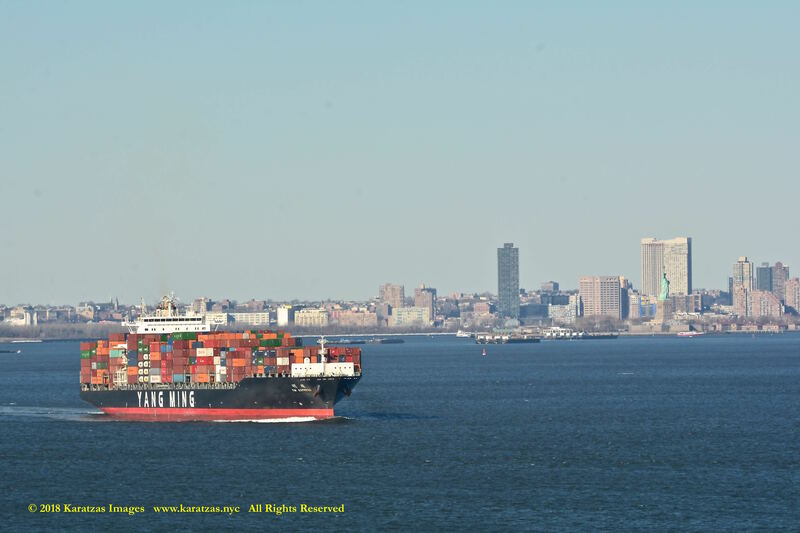 Panamax containership of 4,600-teu MV “YM Express” departing New York. Photographed here against the Statue of Liberty. Image credit: Karatzas Images. 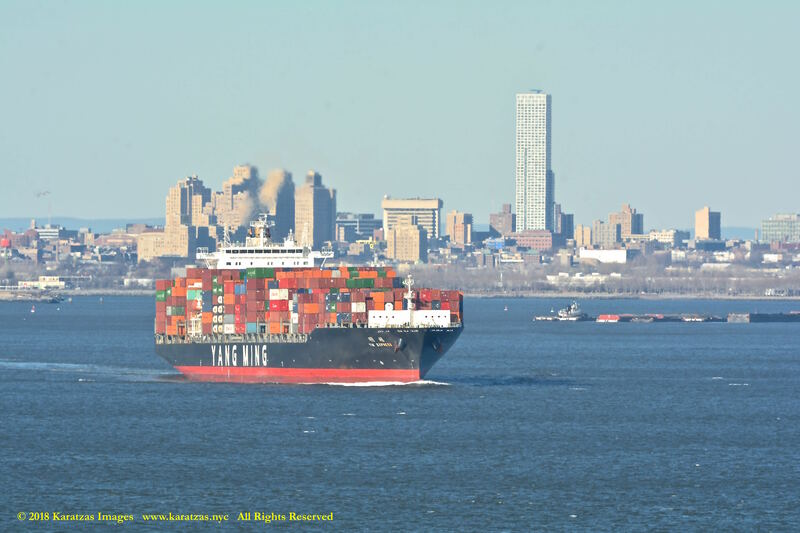 Panamax containership of 4,600-teu MV “YM Express” departing New York. 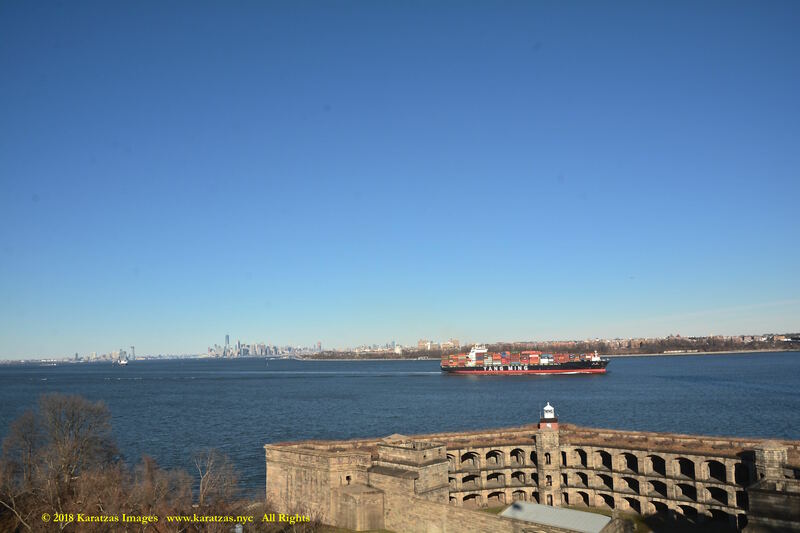 Photographed here against the Manhattan skyline as seen from the south. Image credit: Karatzas Images. 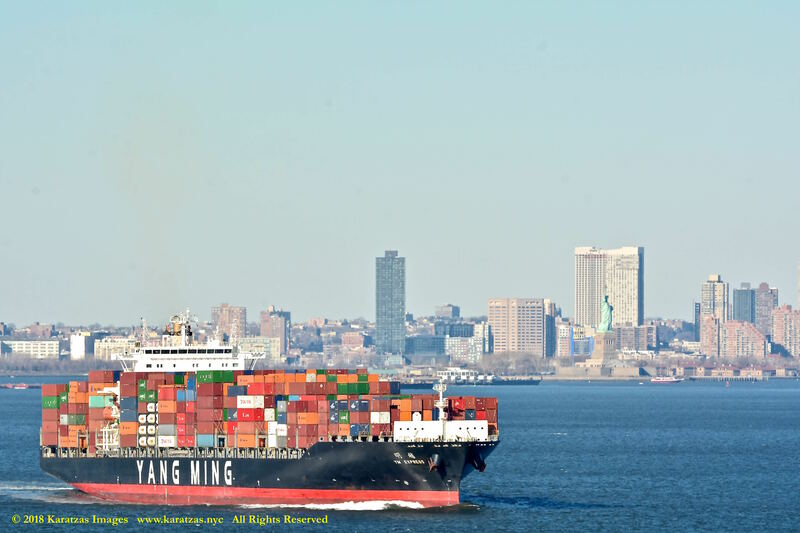 Panamax containership of 4,600-teu MV “YM Express” departing New York. Photographed here against the Manhattan skyline as seen from the south. Port Wadsworth in the foreground. Image credit: Karatzas Images. 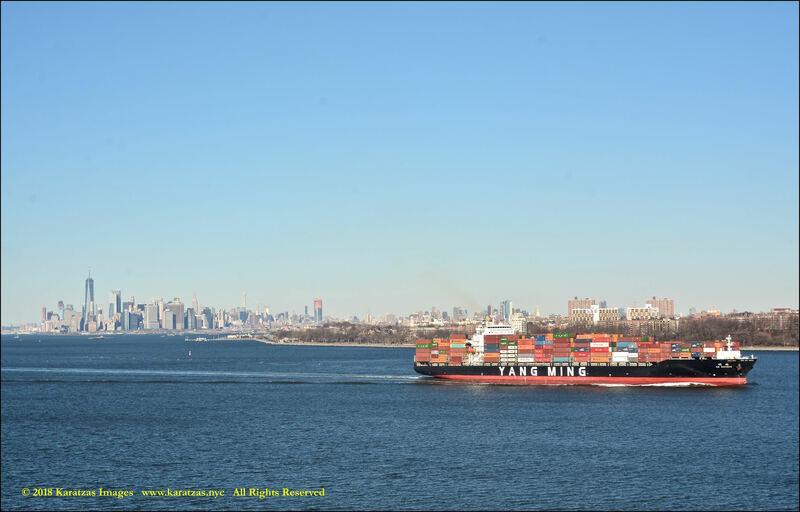 Panamax containership of 4,600-teu MV “YM Express” departing New York. 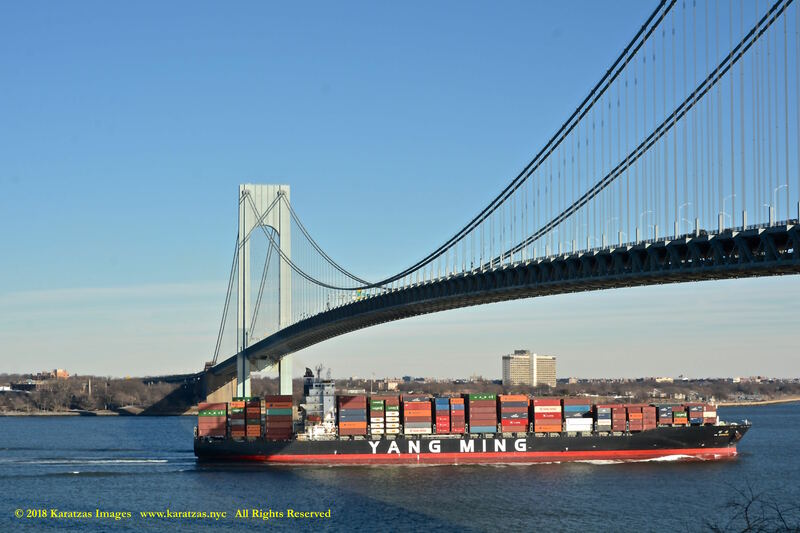 Photographed here under the Verrazzano-Narrows Bridge. Image credit: Karatzas Images. 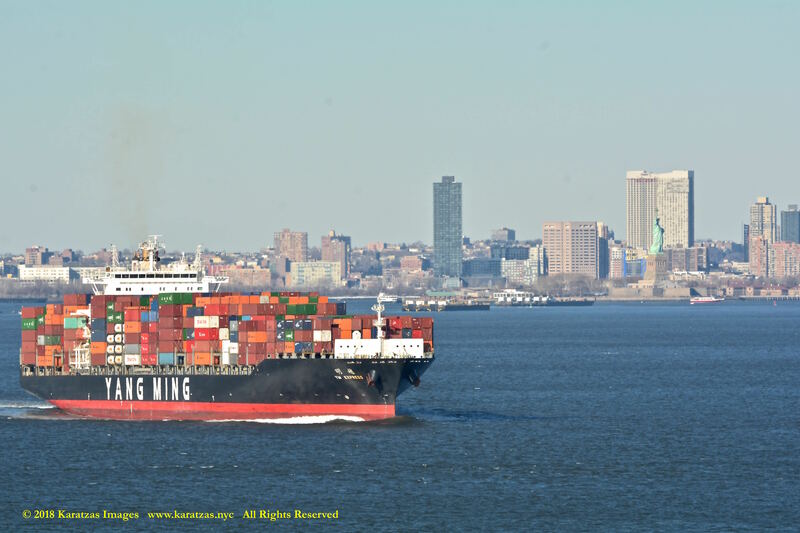 This entry was posted in Containership, Port of New York and tagged AF-S NIKKOR 200-400mm f/4G ED VR II, Containership, Fort Wadsworth, Karatzas Images, Karatzas Photographie Maritime, Lower Manhattan, Nikon D7100 24.1 MP DX-Format CMOS Digital SLR, panamax containership, Statue of Liberty, Verrazano-Narrows Bridge, Verrazzano Bridge, Verrazzano Narrows Bridge, Yang Ming Marine Transport Corp by Karatzas Marine Advisors & Co.. Bookmark the permalink.